Door locks provide the most essential security for homes and businesses. They are the only thing that keeps intruders away from your possessions and family. Burglar alarms and security cameras add an extra layer of protection, but locks are what keeps determined intruders on the outside. To be on top of your security, don’t ignore these door lock problems because burglars won’t; call a trusted locksmith. Despite their importance, most home- and business owners remain dangerously unaware of the need for lock maintenance. Like all mechanical devices, locks break down over time. Sometimes overuse wears down essential components. Other times, locks degrade because they are not used enough, just like a car battery loses power if the vehicle remains off for long periods of time. For an intruder, unmaintained locks spell opportunity. A professional locksmith can inspect locks for problems that may be difficult to notice, such as broken deadlatches, improper strike alignment and deadbolts that fail to fully extend. Locksmiths also provide locks that are superior to those found in retail stores. Cheaper locks provide some security but are mainly a device for slowing down professional burglars. Cheaper locks degrade quickly, and professional thieves know how to exploit any weakness in a lock. When your locks cease functioning optimally, repair is the only way to keep professional criminals out. Here are five signs that your locks have vulnerabilities thieves have the tools to exploit. Does your door refuse the shut properly? Do you have to resort to pushing and pulling the door to get it into the right position? Most likely, a misaligned door latch is to blame. This happens because the door latch and strike plate have migrated out of position. Locksmiths fix this issue by repositioning or deepening the strike plate. When repair becomes impossible, locksmiths reposition the door and install a new lock. Often, small parts in the mechanism have worn out. Sometimes a locksmith can fix the lock, but often the locksmith must install a new lock. This problem needs prompt attention, both for home security and to prevent damage to the door. Remove the key and avoid forcing it to turn. When people try to force the key, it often breaks off, leaving chunks of metal inside the lock, which may destroy the lock. Often, locksmiths can use specialized equipment to fix the problem rather than having to install a new lock. 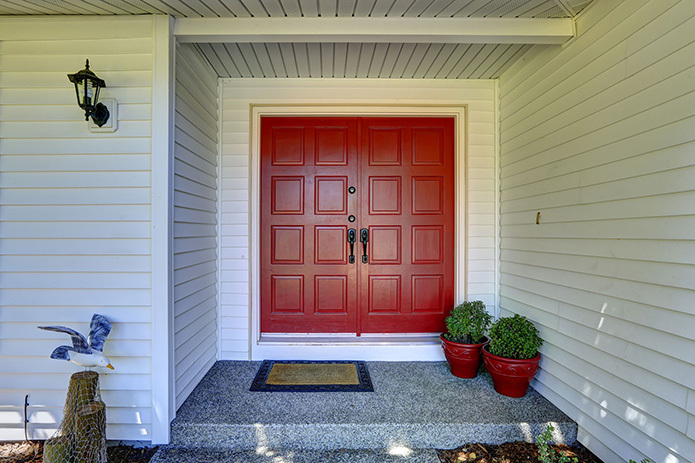 The weather distorts doors over time, which can ultimately lead to problems with your lock. The distortion stresses mechanism components and causes them to migrate. A locksmith can correct the distortion, so your door and lock function optimally. As with many maintenance issues, faulty mechanisms show signs of wear and tear before they break. When the lock fails to engage without being forced or the key becomes difficult to turn, it’s likely that the lock needs repair. Locksmiths install high-quality locks that foil burglars. When these locks are maintained, criminals have no vulnerabilities to exploit. Locksmiths can also provide additional hardware for increased security. An optical door viewer should be on every outside door that doesn’t have a window. Knowing if a person outside can be trusted often requires seeing who they are. If your property has an outside door that lacks an optical viewer, a locksmith can install one so you can see outside without opening the door to a potential intruder. Locksmiths also use reinforcement hardware to shore up the vulnerable points that burglars pressure when forcing entry. Common vulnerable points include the door jamb where the strikes are located, the edge where the locks sit and, of course, the hinges. With these areas reinforced, burglars will find forcing entry too difficult. A good lock provides the only defense against intruders. Cameras and alarms help after an intrusion occurs. They alert the homeowner and law enforcement to the problem and help catch perpetrators. Locks, on the other hand, keep burglars out of your home or office in the first place. Thieves look for weak locks. For true burglary protection, police departments recommend all doors have deadbolt locks with a reinforced strike plate and three-inch screws. These locks are not easily forced, and most burglars won’t succeed. In addition to well-maintained, strong locks, it’s also important to lock interior doors to attached garages and all windows. When thieves can’t force the door, they look for other weak points. It is important not to ignore any door lock problems. Being proactive is wise and safe. Contact your local and trusted locksmith to find out how they can help. Action Locksmith Inc is a family owned business that has been helping Michigan residents for over 30 years. Through hard work and dedication, Action Locksmith, Inc. has grown into one of the best locksmith companies in Michigan. From simple re-key services to access control and camera systems; Action Locksmith Inc. does it all. Call us for a security consultation where we conduct a detailed survey of your home or business security and provide a plan of action. Our locksmith services are available throughout Michigan and beyond!